It’s that time of year when dance institutions like London Studio Centre present end-of-year performances to showcase the hard work of both staff and students over the year and particularly over the last three months of preparation. Ultimately it’s the students who take off on the stage while teachers and staff remain on the ground to prepare for the next flight. In the case of London Studio Centre, whose intake of dance students over 3 years of training in multiple disciplines is around 360, there are just five this year specializing in classical ballet. With the quality of training and opportunities artistic director Jennifer Jackson brings to these third-year students and considering classical ballet technique is the underpinning of so many contemporary dance companies, this number is surprisingly and disproportionally small. 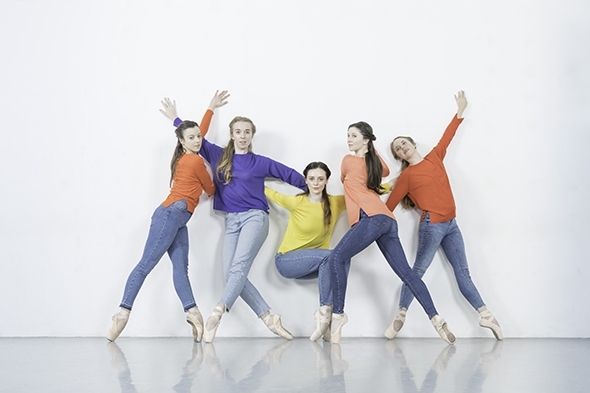 To make up the numbers for these performances Jackson has recruited three second-year students (Daisy Bishop, Maria Bruguet and Esme Calcutt) to join the graduate year of Demi Aldred, Eleonora Gatti, Anna Heery, Shannon Higgins and Hannah Orton. Images Ballet Company was originally founded in 1991 under the artistic directorship of former Royal Ballet principal Margaret Barbieri. That lineage of the Royal Ballet continues through Jackson and, in these performances, through choreographers Érico Montes and Hubert Essakow who were both dancers in the company (Montes also trained at London Studio Centre). Bim Malcomson’s witty, fresh approach and Morgann Runacre-Temple’s blend of dance and theatre balances the classical work with a variety of styles these dancers can expect as they pursue professional careers. It is not so much the works produced in these year-end performances as the effect they produce on the dancers; they are the ones being assessed for their potential even if the choreographers benefit from the opportunity to create new works. Inevitably each dancer will bring to the stage a quality or characteristic that will define her in some way from the others; ideally over the four works something unique will emerge in each dancer. The responsibility for its achievement is on the shoulders not only of Jackson and her choreographers but of the dancers themselves. I admire Jackson’s insistence on live music where possible; if she doesn’t have an orchestra she has at least Elliott Perks and Tom Ellis. They arranged Robert Schumann’s Märchenbilder for viola and guitar which they play on stage for Essakow’s Cut Out and they perform for the audience in between works. It’s a shame they cannot be used more as the sound and texture of live music brings out the quality of dance steps while the dynamics of music and choreography can have a living conversation. Indeed, Essakow intended the four movements of Schumann’s music to form a series of choreographic conversations and in Aldred he has an artist who is eloquent. She has a strong technique, steely but soft pointe work and above all eyes and gesture that communicate not only with the music but with the audience. It is as if she is at a gathering with four friends; they chat together but the music draws her away to converse with her inspiration, the unseen Schumann. Essakow creates a sense of intimate space and Louie Whitemore’s black brocade bodices suggest a nineteenth century period style. If Aldred takes her place in the room, Heery is noticeable by her natural reticence; she has the lyricism of a dreamer. In Montes’ Sonata in Colour to the music of Florence Price, Heery is like a lost girl remembering; Montes invests his choreography with an ethereal sense that reaches back to classical ballet but finds in Heery an interpreter whose quality of gesture is very much in the present. Malcomson takes an idiosyncratic, somewhat irreverent approach to classical dance that brings out the idiosyncracies and irreverence of the entire cast. Her Red Queen Brouhaha references Lewis Caroll’s Alice in Wonderland and uses some of Joby Talbot’s score for Christopher Wheeldon’s ballet of the same name. There are lots of jam tarts, a croquet waltz, outraged screams and Orton coming into her own as Alice looking through both ends of an imaginary looking glass. Gatti and Higgins both find their comic form here as Malcomson proves her value as a catalyst in bringing diverse personalities together in a riotous whole. Runacre-Temple’s Mozart’s Women: The Kingdom of Back uses extracts of Mozart’s music and recorded readings of his letters to his sister Nanneral (Aldred), his muse Aloysia Weber (Heery) and her sister, Constanze (Gatti), who became Mozart’s wife. It’s a piece that cries out for powdered wigs and voluminous dresses to evoke the texture of these women and to connect their play of gesture to the music but in its current form, under Andrew Ellis’s islands of light, it is a refined miniature that pays equal tribute to the women portrayed and to those who portray them. The evening ends as it began with the music of Schumann, the two final movements of Essakow’s Cut Out, one for the ensemble and one that provides a parting solo for Heery. Images Ballet Company is a showcase for the dancers who choose to specialize in classical ballet in their final year of professional training at London Studio Centre. The program at Lilian Baylis Studio tests this training in a broad spectrum of dance performance that challenges the students’ versatility and stretches their expressive abilities. While Artistic Director Jennifer Jackson’s own work of the evening, Distant Beauties, is the one work to merge classical technique with a classical image, Matthew Hart’s Concerto for Joyce and Dennis uses pointe work in a contemporary setting, and Morgann Runacre-Temple’s Handsfree uses classical articulation and elongation in an abstract work. Only Liz Aggiss, who comes from the august tradition of German Ausdruckstänz, makes the technique utterly subservient in her Scenes of Death and Destruction to a rich expressive approach to dance that just happens, in its irreverent approach to classical ballet structures, to deconstruct them with evident relish. It might be said that this year-end showcase reflects the current prospects for students of classical ballet in this country and elsewhere, as Jackson is well aware (just consider Scottish Ballet’s recent program of works by Angelin Preljocaj and Crystal Pite). Her decision to include such a variety of styles will serve her dancers well as their comfort levels are tested from work to work. Shaun Reidman, the one male in the group, does not look entirely at home in Distant Beauties, but in Scenes of Death and Disaster he comes into his own as the figure of Death replete with black cloak and scythe. Eleonora Falovo carries the narrative in Concerto for Joyce and Dennis so convincingly as Joyce that she looks out through her eyes. This kind of transformation is at the heart of performance and Falovo’s natural ability to unite her technical ability with a high level of expressivity is a gift for dance narrative in whatever form it might take. Jackson’s Distant Beauties is loosely based on the pas de six from the Petipa/Tchaikovsky ballet, Sleeping Beauty with which she would have been familiar in her days as a soloist with the Royal Ballet. Rather than getting her dancers to execute Petipa’s choreography, Jackson models the steps on the capacities of her dancers and ascribes contemporary values to the six Fairies of integrity, independence, humility, talent, resilience and confidence. By choosing Tom Armstrong to adapt Tchaikovsky’s score for a viola and flute (played live on stage by Rosie Bowker and Henrietta Hill), she has created a sparse aural environment which the dancers have the chance to fill with their ensemble work and solos. Classical technique is notoriously difficult to execute well, and not all the dancers do justice to the steps but they maintain the spirit behind them. Maria S. Catalayud managed both in her variation with a confidence that is a pleasure to see. One of the characteristics that gives unity to the evening is the way Bowker and Hill play through the pauses between works, transitioning from one musical style to another as they wander like minstrels on stage. It allows the huge social gap between the Russian Imperial court and a care home to be bridged effortlessly along with the sterling efforts of the crew to transform the stage. The central character of Concerto for Joyce and Dennis is modeled on Hart’s own grandmother whose physical condition has rendered her housebound and subject to a carer (Reidman) who doubles as her late husband. The cast enters into this poignant portrayal of memory and friendship with conviction, though the ideas in this narrative work carry a weight well beyond the scope of this performance; it is full of short scenes and episodes that strike me as the seed of a musical in which a larger, more diverse cast could more realistically portray the disparity in ages and physical (dis)abilities. Handsfree, to the eponymous body-percussion score by Anna Meredith, is a response both to the music and to the sculpture of Dorothea Tanning. 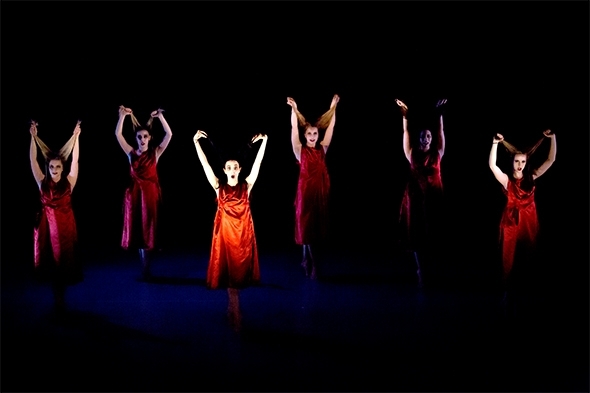 Set in rectangles of light that Runacre-Temple seems to relish, Handsfree is a complex rhythmical exercise in which the four dancers (Falovo, Catalayud, Courtney Reading, and Jessica Harding) engage with the music and with each other in close partnership where they seem to listen to the music in each other’s bodies. The exhilaration from the dancing and from the score itself is palpable, though the work seems more weighted towards Meredith than Tanning, missing a sufficiently visual component to satisfy the eye. The title of Scenes of Death and Disaster accurately describes the progression of Aggiss’s work, from Reidman’s slow, cold, majestic entrance as the figure of death to the seven women with disheveled hair complaining about male choreographers of classical ballets who portray women as weak with a propensity for untimely deaths. Musically it progresses from its music box introduction through sampling of the ballet classics of Giselle, Swan Lake and Romeo and Juliet to earthy gypsy tunes and Highland bagpipes. Its irreverence for the classical canon belies the rigorous construction of the work and the expressivity required of the dancers to make it work. And work it does, with ferocious wit and satire both in what it says and the way the entire cast says it. That Jackson has the pragmatism and insight to program this broad scope of work is testament to her stewardship of the company.